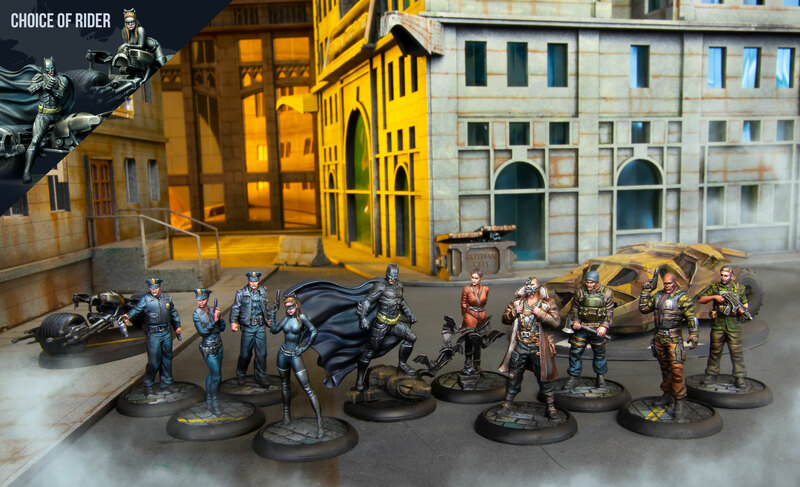 This comprehensive starter set is packed full of models and accessories – everything you need to start playing the Batman Miniature Game. Based on the events of the Dark Knight Rises movie, this boxed set contains two complete crews of resin miniatures (Batman, Catwoman and the GCPD vs Bane and his mercenaries), including a Batpod and – for the first time – the Tumbler Batmobile! You’ll also find full-colour, slot-together card scenery, markers and counters, cards, dice, templates, and a set of Quickstart rules complete with introductory scenarios. This is the ultimate boxed set for BMG!. Batman (Dark Knight Rises): Having witnessed his parents’ death at the hands of a mugger, Bruce Wayne traveled the world to train and understand the criminal mind in order to combat it. Mentored by Ra’s al Ghul, Bruce later returned to Gotham and challenged the city’s crime lords, employing an array of gadgets, weapons and tactics as a mysterious black-garbed crusader known as Batman. Catwoman: Selina Kyle is a world-class cat burglar and mistress of disguise, better known by her alias as ‘the Cat’. She is cunning, devious, and cynical, but is in search of a fresh start in life. She targets Gotham’s wealthiest in her schemes. Her weapons usually include infrared goggles, bladed high-heel boots, and a belt filled with lockpicks. Bane: Possessed of incredible strength and cunning, Bane is a field commander of the League of Shadows, and sworn protector of Talia al Ghul. One of the few villains to have defeated Batman in single combat, he has vowed to bring Gotham to its knees. Bane’s identity is hidden behind a grotesque his mask, which inhibits the excruciating pain that wracks his body, allowing him to focus on his mission. Bane’s Mercenaries: Bane arrives in Gotham City at the head of his own personal army. Bane’s mercenaries are highly trained militiamen, including several members of the League of Shadows. Utterly devoted to their cause, and skilled in urban warfare, they pose a lethal threat to the city’s police force. The Batmobile: A prototype armored tank designed as a bridging vehicle for the military, the ‘tumbler’ (aka the Batmobile) includes sophisticated weaponry and jet-boost capabilities. When Bane and his soldiers detonate a device beneath Wayne Enterprises’ Applied Sciences Division, they make off with three Tumblers left in storage. These prototypes are equipped with retractable dual-barreled cannons and a multiple-tube missile launcher.